So there were two different views, and the fundamental difference was over discretion versus rules-based policies. From the mid-1960s through the 1970s the Samuelson view was winning with practitioners putting discretionary monetary policies into practice, mainly the go-stop policies that led to both higher inflation and higher unemployment. Friedman remained a persistent and resolute champion of the alternative view. Fortunately, Friedman’s arguments eventually won the day and American economic policy moved away from an emphasis on discretion in the 1980s and 1990s. Paul Volcker, who as chair of the Fed implemented the more rules-based policy, had to confront the disparity of views as he did so as I described here. But this same policy debate is back today. Economists on one side push for more discretionary monetary policy such as the quantitative easing actions and resist the notion of rules-based monetary policy. Other economists argue for a return to more predictable and rule-like monetary policy. They argue that the bouts of quantitative easing were not very effective, and that deviations from rules-based policy helped worsen the great recession. Of course there are many nuances today, some related to the difficulty of distinguishing between rules and discretion when the zero lower bound is thought to be a constraint. Interestingly, you frequently hear people on both sides channeling Milton Friedman to make their case. The debate is not merely academic. Rather it is a debate of enormous practical consequence with the well-being of millions of people on the line. The House of Representatives has passed a bill calling for the Fed to describe its policy rule and recent Fed reports have talked about normalization raising questions about a return to rules-based policy. The same issues arise in discussions of unconventional monetary policy in Europe and Japan. Can the disagreements be resolved? Milton Friedman was optimistic that debates could be resolved, and I am sure that this is one reason why he kept researching and debating the issue so vigorously. Today people on both sides can learn from him. First, while a vigorous debater he was respectful, avoiding personal attacks. Second, he had a strong believe that empirical evidence would bring people together. Yes, people would come to the issue with widely different prior beliefs, but their posterior beliefs—after evidence was collected and analyzed—would be much closer. In this way the disagreement would eventually be resolved. Although posterior beliefs in the monetary area now seem just as far apart as prior beliefs were 50 years ago, I sense that empirical work on the policy decisions of recent years, like the empirical paper by Alex Nikolsko-Rzhevskyy, David Papell, Ruxandra Prodan, can bring about more convergence of views. 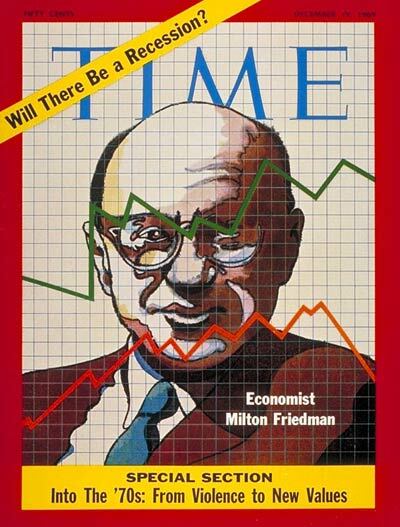 As I said at the time of his 100th birthday, clearly we can learn a lot from Milton Friedman in deciding how to proceed.